When Kristin heard that her high school friend Magdalena would be in Prague for a few days visiting her family, we decided to hop in the car and join the party. We weren't actually invited. But Magdalena and Jonathan were very welcoming despite crashing their trip. We started the day by hiking up to the top of the Prague Castle district (the Pražský hrad) to get a great view of the city. 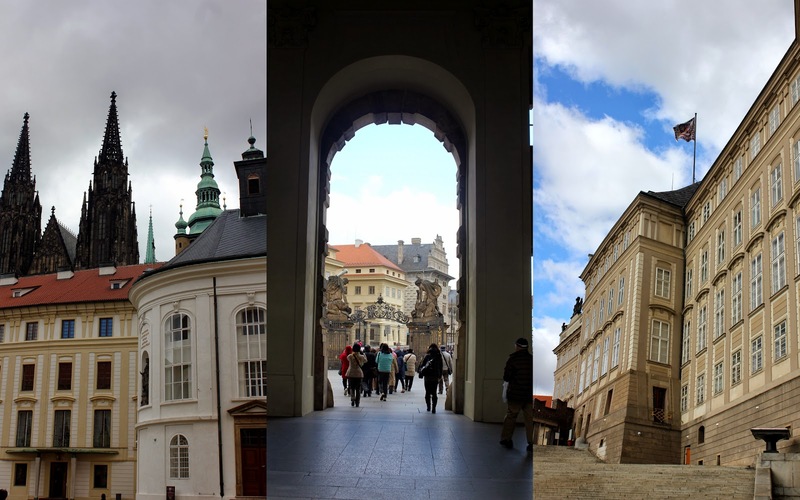 The castle area towers over Prague and provides panoramic views of the city, Vltava River and many bridges. Pay no attention to what is under that coat. Nothing to see here (other than the pretty view). Say dobry' den (hello) to Magdalena and Jonathan. Although the view over the city is enough to convince you to climb up the hill, the castle at the top is pretty spectacular. The castle isn't a single building, but a series of churches, palaces, government buildings, tiny homes and gardens built in a complex spread over 17 acres. The original structures date from the 9th century and include an eclectic mix of architectural styles reflecting the more than 1,000 years of building at this spot. 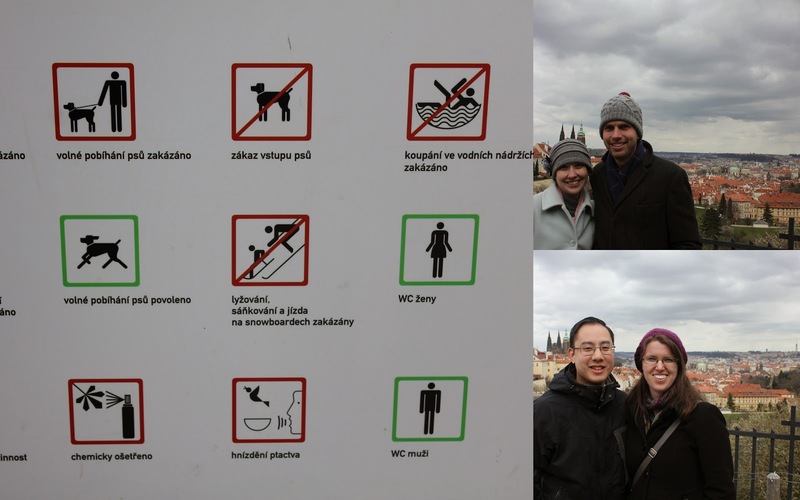 After we let Magdalena translate the very detailed Czech sign about ticket purchasing (she didn't notice the English version, so we let her show off her amazing language skills for a while), we headed out to explore the castle grounds. 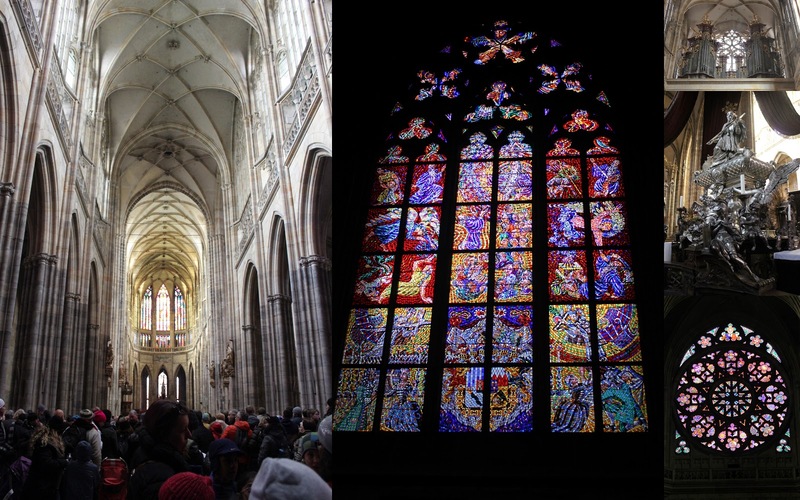 We started at the gothic St. Vitus Cathedral. 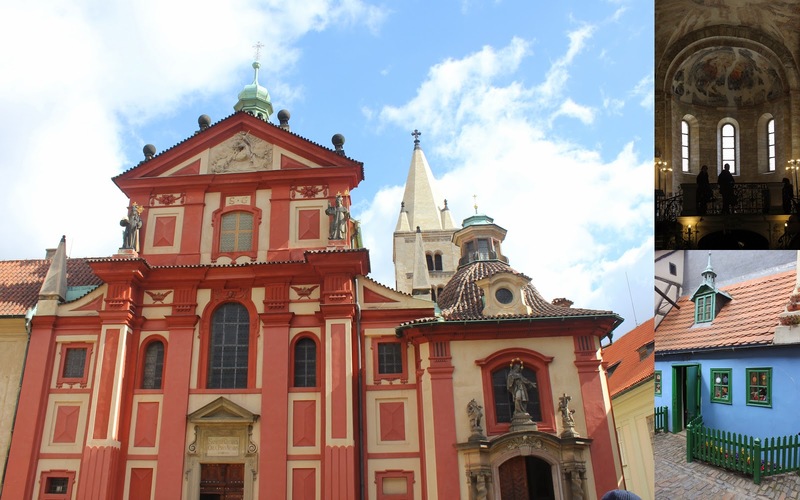 It is the largest church in the Czech Republic and holds the tombs of a number of Bohemian kings and Holy Roman Emperors. 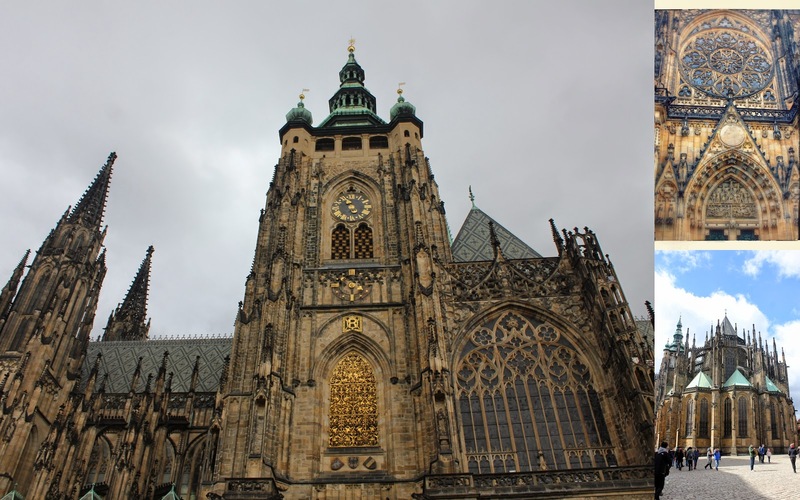 The cathedral was started in the 1300s, but wasn't completed until the early 1900s. The exterior sports a series of crazy-looking gargoyles protecting the church (and providing fancy downspouts for rain water). These are frightening in person. The inside is particularly ornate, with lovely stained glass, crypts and a large organ. And lots of people. Next up was the Golden Lane (which is a bunch of really tiny, colorful houses), Vladislav Hall (a really big hall used for banquets, but not pictured, since you have to pay an additional fee to get a sticker to photograph inside), and St. George's Basilica (a 10th century church with a colorful baroque facade that was added much later). 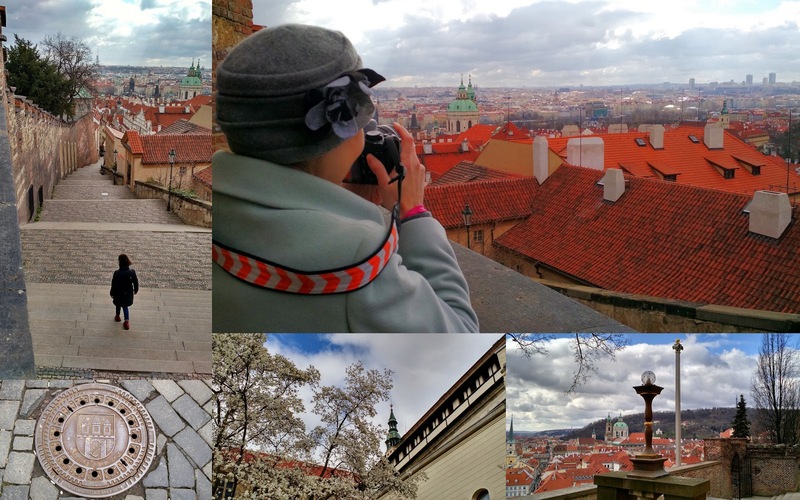 After an awesome lunch at a Czech brewery at the monastery near the castle (where we discovered that Czech food is basically a flavor of German food), we headed back down the hill for some glamour shots overlooking the city. Although there were a lot of rules for the walk back. No swimming in the fountains. Or snowboarding. Prague is pretty magical at night. Fantastic old buildings. Vintage trains. Lots of charm. The best part is that at night the buildings are aglow. It was wonderful to get lost in the city and simply wander around taking in the architecture. The next day, we hired a very reasonably priced guide to show us the sites of Prague's Old Town. 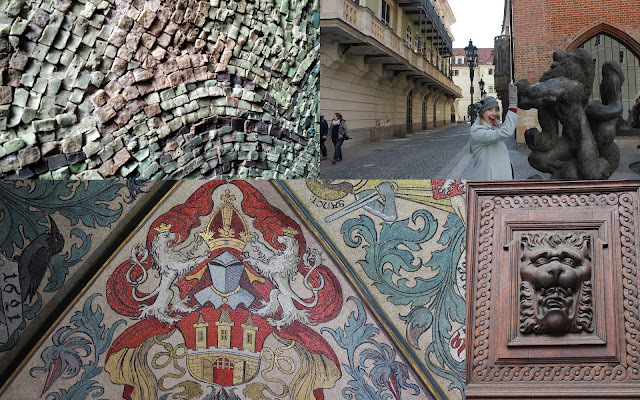 We wandered through the city for a walking history lesson. 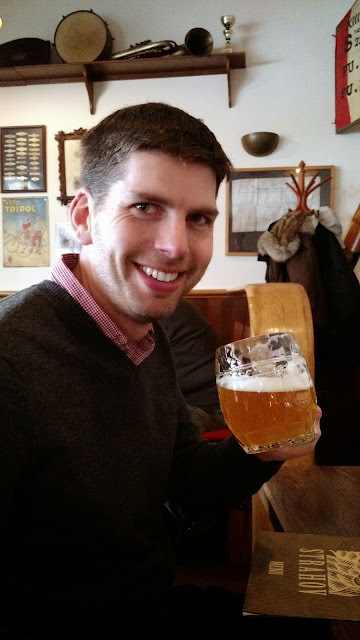 The guide was fantastic and knew a little something about everything in Prague--from history to architecture to beer. 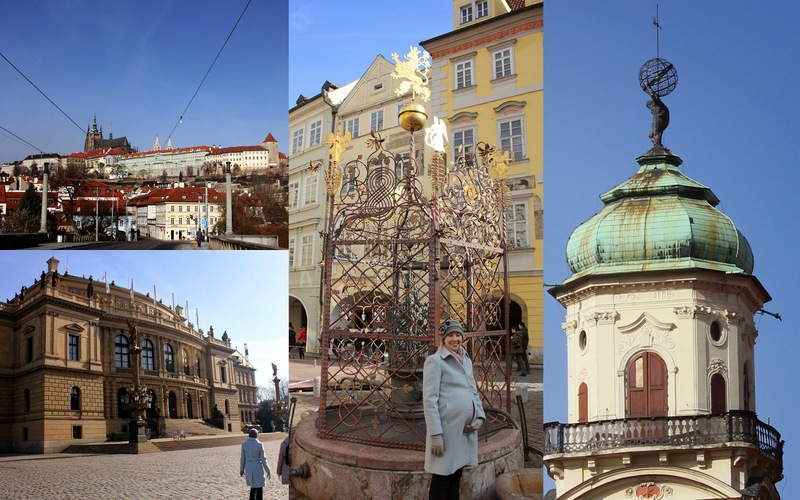 We spent a lot of time at the Old Town Square, checking out the Astronomical Clock (the Prague Orloj) and the Gothic Church of Our Lady before Týn. The square was packed because the Easter market that was taking place that weekend. The astronomical clock was first installed in the square in 1410 and is the oldest one that still functions. Every hour the figures on the clock are animated for a short (and really uneventful) show. 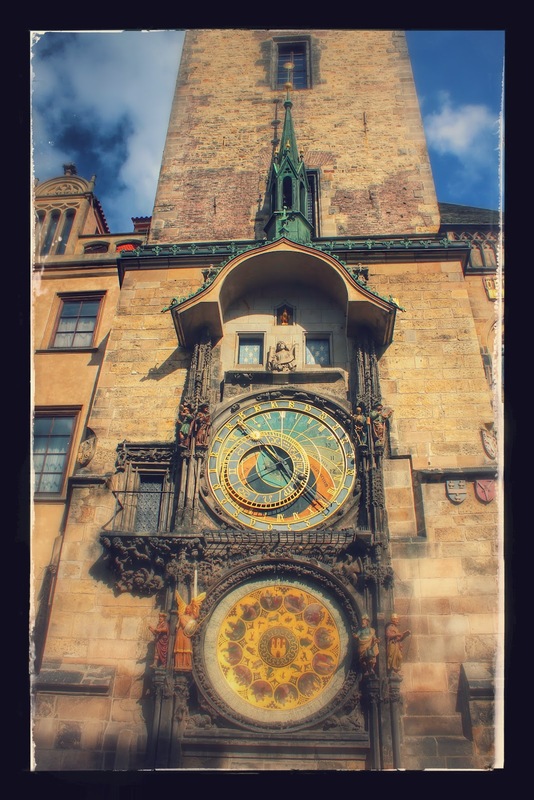 But the clock itself is so intricate and beautiful that it merits a prolonged visit. Inside the old town hall attached to the clock was a wonderful mosaic ceiling featuring the history of the founding of Prague. Lions are a bit of a theme. After our tour we took a final walk over the historic 15th century Charles Bridge, which crosses the Vltava River. The bridge is littered with tourists, but is still a beautiful walk between the really, really old and really old parts of Prague. We were sad to have to leave after such a quick trip, but were thankful that we got to spend some time exploring with great friends.